Haddonfield is known for its historic sites and walkable downtown. For Pokémon Go players, that makes the borough a treasure trove just waiting to be explored. “There is an abnormal amount of PokéStops here. It’s perfect (for Pokémon Go). 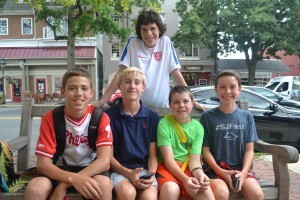 And with all of the shops, there are convenient places to stop,” Haddonfield resident Matthew O’Leary said while he was walking the downtown playing the game with four of his friends. Based on the hit ’90s franchise Pokémon, Pokémon Go is the latest free mobile app that is taking the nation — and world — by storm. Just after its release on July 6, the game became the top app in the Apple and Google App Store in the United States and, according to Survey Monkey, is the biggest mobile game in U.S. history with 21 million daily active users. For the game, mobile devices are used to be able to see Pokémon in reality on their screens. The app uses the GPS and phone camera to create the illusion that Pokémon are right next to players and are able to be captured. PokéStops and Pokémon Gyms, located at historic or well-known sites in the real world, help users gain special items required in the game and allow players to battle each other in a friendly match, respectively. 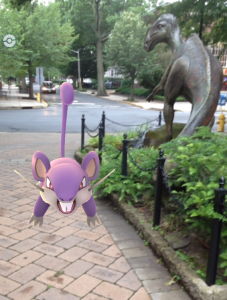 Due to Haddonfield’s wealth of historic sites, it is a hot-spot for Pokémon Go. The appeal of the game is nostalgia for many, but also getting outside, exercising and socialization. Teenagers to adults in their 40s, 50s and beyond are playing the game. “I always knew about the Pokémon franchises and thought it was really cool, and seeing it in reality, it is almost like a dream,” Matthew said. 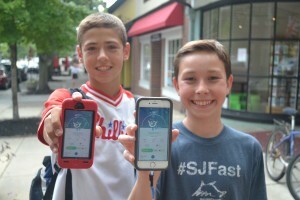 Matthew, Taite Roche of Haddonfield, Zach Williams of Audubon, and Ethan Spillane and Christopher Spillane of Barrington had been playing Pokémon Go in Haddonfield for about two hours last Wednesday, exploring the Haddonfield streets and capturing some Pokémon. They all had mostly good things to say about the app, loving the capturing and battling aspects. “I like how you get exercise while you’re having fun with your friends getting Pokémon,” Taite said. “It increases social health and mental health,” Zach said. Trey Roberts, who works downtown, started playing because he was bored and wanted to try a new game. He found he really loved seeing all of the people walking around. His favorite part is catching the Pokémon. The group of young boys thinks that Haddonfield is a great place to play the game and feels that the local businesses can benefit from the game. They recommend creating discounts for players, like at Maurizio’s Bistro in Moorestown where the business offers $1 slices of pizza to kids who come in and present the app on their phone. “I feel like you can have a lot of business from Pokémon Go… (Businesses) can do discounts around here for how many Pokéstops there are around here,” Christopher said. 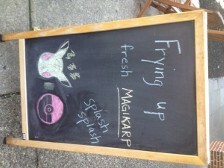 Businesses in Haddonfield don’t seem to be doing such practices, however, they are getting into the spirit. 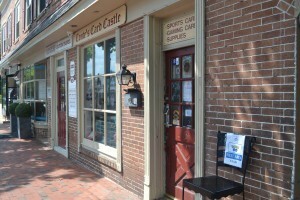 Tony Conte, the owner of Conte’s Card Castle, has ordered more Pokémon cards and seen a small increase in sales. “I figured since most of my customers play those games and on day one of the release, they were all walking around playing (Pokémon Go). I figured I would put the chair out for them as a courtesy,” Conte said. As fun as the game is, players did say it had some faults. The app crashes a lot, uses a lot of battery life and data, and can be a distraction from surroundings. “I know there are a lot of people that I see that don’t really pay attention and that can be a problem, similarly to texting and driving. Other than that I think it is great,” Roberts said. “Definitely bring some friends with you, for safety, especially late at night,” Matthew said. “If you are going to go out for a long time bring chargers,” Ethan added. However, Conte too feels there are a lot of positives to the game, so people should be focusing on the positives over the negatives. “People just getting out there when they’re bored is a positive thing. I like to look at the positives, like the exercise and having something to do,” Conte said.